It’s the best-selling Toyota nameplate of all time and even though shoppers are leaving the traditional car segment in favor of crossover SUVs, the company isn’t ready to leave 275,000 annual U.S. sales on the table. 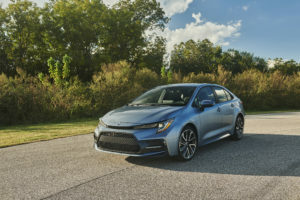 Following on the heels of the impressive Corolla Hatchback is this all-new 2020 Corolla Sedan – it’s most popular bodystyle. Twelve generations strong, the Corolla is the latest Toyota to showcase a bolder design. From wheel to wheel its measurements are the same as before but this car is wider and lower with a shorter hood for better forward visibility. Various trim levels cater to distinct tastes with XSE and SE grades being the sportier pair with L, LE and XLE models playing it more conservatively. As such this XSE is the first Corolla to ride atop 18” wheels while also receiving a body-color chin spoiler, additional aero elements and model-specific LED front lighting with smoked lenses in the rear. Having already tested it, I can tell you the new powertrain is a winner, pairing a 169-horsepower 2.0-liter engine with a very smart CVT delivering a vivacious driving experience. And yes, a 6-speed manual is still on the menu with a sporty downshift rev-matching feature designed for smoother shifting and improved handling. Assuming it drives similarly to the Hatchback, the new sedan with its stiffer body and thoroughly uprated suspension provides more fun than ever before. This new platform also promotes a much quieter cabin. Technology moves to the forefront with standard Apple CarPlay, Amazon Alexa, and Wi-Fi Connect while high-end safety features are also standard such as Radar Cruise Control, Road Sign Assist, Auto High Beams and more. The all-new 2020 Corolla Sedan arrives in dealerships next spring.